TRAKTOR SCRATCH A6 is designed for DJs who need rock-solid performance, amazing audio quality and incredible ease of use.The included TRAKTOR SCRATCH PRO 2 software with Remix Deck� technology allows for a new level of creativity - seamlessly merge the worlds of DJing and live performance. TRAKTOR SCRATCH A6 gets the remix treatment and now delivers an immense package for creative DJs. Using TRAKTOR SCRATCH DUO 2 as a jumping off point, TRAKTOR SCRATCH A6 now contains the flagship TRAKTOR SCRATCH PRO 2 with Remix Decks software � at a new price that makes it the most incredible value out there. Powered by the TRAKTOR AUDIO 6 interface - now available exclusively with this product - you can also expand your setup to include TRAKTOR KONTROL F1 for ultimate and intuitive control over the software�s Remix Decks. It�s never been easier to spin digital files. Hook up the system in seconds thanks to the plug-and-play hardware and software integration. The software interface features an easy-on-the-eye Essential View, focusing on the important elements. Innovative TruWave colored waveforms let you see your tracks like never before. With full iTunes� integration, iPod� compatibility and Crate Flick cover art browsing, selecting your tracks is a cinch. The included SoftSync feature gives you optional help in beat-matching. Store your favorite loops in the library, along with the included loop content, and open up another dimension in creative DJing � easily remix and re-edit tracks on the fly. 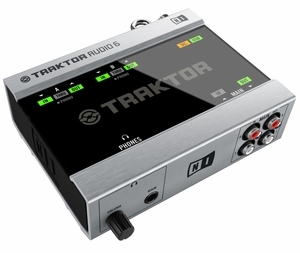 The Native Scratch technology features TRAKTOR SCRATCH MK2 timecode vinyl and CD control for the next step in tight timecode performance. Spin super-precise 2kHz control signal on 120g vinyl � it feels just like your digital track was cut to a 12-inch � and with the innovative vinyl marker stickers you get clear visual reference at all times. Alternatively, use your CDJs with TRAKTOR MK2 timecode in relative mode, and stay ahead of the competition � with TRAKTOR�s loops and hot cues and your CDJs� cue and manual looping functionality, you get the best out of both systems.